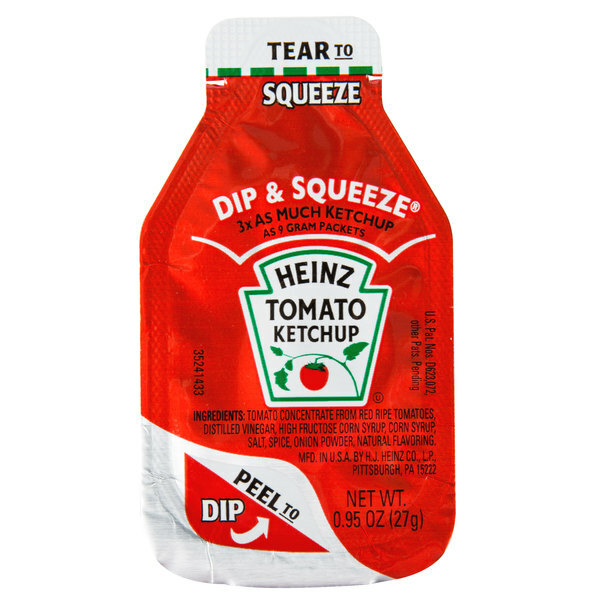 Made from fresh-ripened tomatoes and a special blend of spices, onion powder, and vinegar, this Heinz dip and squeeze ketchup packet adds a satisfying sweet and slightly tangy flavor to any menu item with ease. Its vibrant red color, smooth consistency, and sweet juicy taste make it an ideal option to dip and enjoy with mild fried foods or spread on top of sandwiches. Tear off one end and the ketchup squeezes out, perfect for adding on top of a hearty and fresh, juicy burger. Peel off the top lid and this packet also becomes the perfect container for dunking hot, freshly fried chicken tenders. This ketchup is created from premium tomatoes, grown by Heinz from a special seed that produces rich tomatoes packed full of nutrients. Heinz ketchup includes essential vitamins, minerals, and lycopene, a healthy antioxidant found in cooked tomatoes. 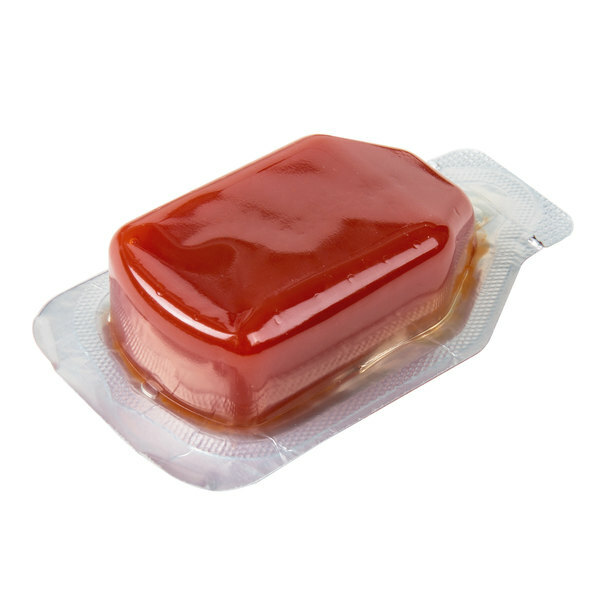 Plus, coming with 300 individual pouches, you're sure to have enough on hand to satisfy customers with the condiment they grew up with and still love. 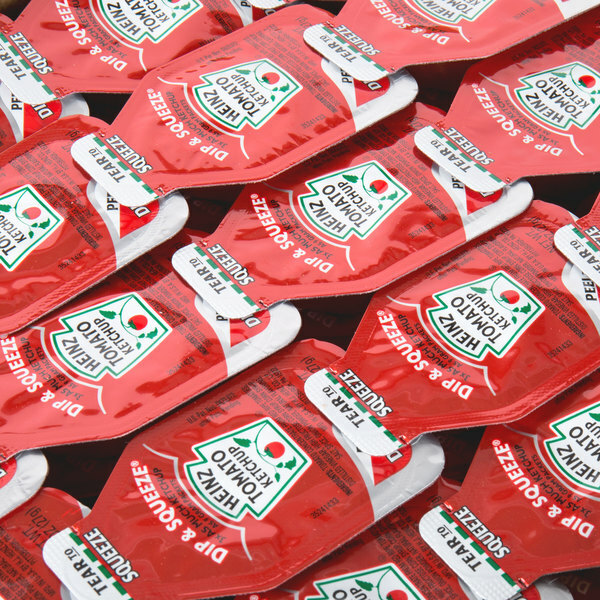 I am always happy when I see Heinz Dip & Squeeze Ketchup Packets offered in the condiment trays. They're so much easier to use for dipping fries or other foods and much less messy than regular squeeze packets when I'm on the go. I love this product. All the flavor and quality of Heinz Ketchup packed in this generous little portion-control container. It's versatility allows for squeezing or dipping and is great for on-the-go or large gatherings. Can't go wrong with Heinz Ketchup! 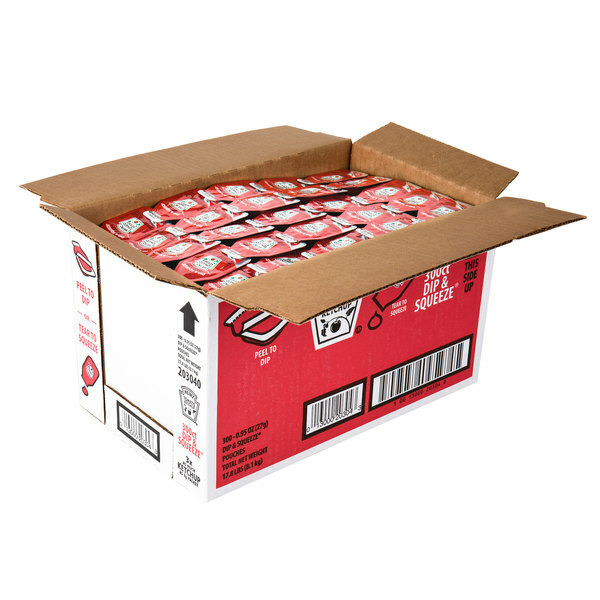 Thick and creamy, Heinz is the number one name in ketchup. These handy little dip & squeeze packets are perfect. The peel-back corner makes them easy to open and leaves you with a perfect little cup to dip. These are perfect for in-store or on-the-go. Can't say enough good things about this product. These little Heinz ketchup packets are really cool. You know that it is going to taste great because it is Heinz. I am always curious to see if they will dip or squeeze. Seems to be about 50/50. I love these Dip & Squeeze packets for in store, in the car, and at home use. Their perfect size saves money and mess by limiting portion control. The versatility of the packaging makes them a big win for adults and for kids. And, as always, the Heinz name means quality that just cannot be beaten. Cannot say enough good things about this product. This is my favorite ketchup for individual servings because it gives you the abilty to SQUEEZE the ketchup and/or DIP your food into the cute, soft plastic container which are even shaped like little bottles of ketchup. Not surprisingly it's made by Heinz, IMO the best flavored ketchup on the market. These packets also have 3X AS MUCH KETCHUP as 9 gram packets so more bang for your buck. To me, you just can't find a better choice! What I love about this product is that you have the option to use it as a dipping cup or a squeeze pouch. Nothing about the product is different, but the application is so much less messy! 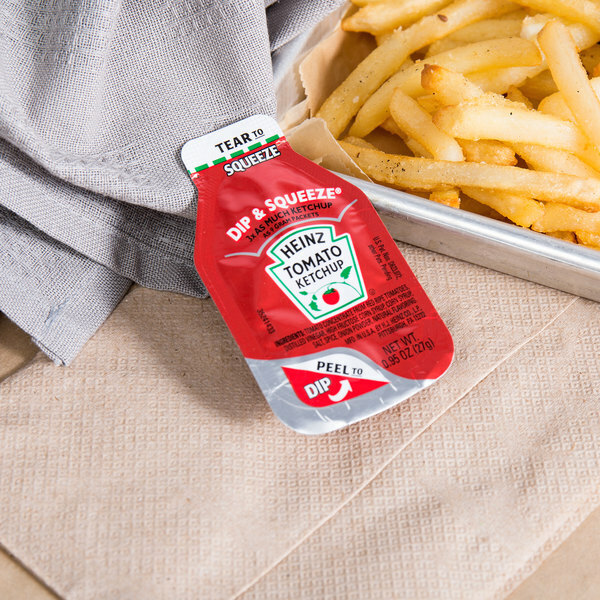 These ketchup packets are more like a ketchup cup. They are perfect for dipping fries our chicken strips in and are sure to make your customers happy. I highly recommend this product.